Back when I questioned massages in Midtown, I was alerted to the Tunnel Top bar. Told it was a great bar, I checked it out this weekend. While it’s not really my style, a little too yuppie, I did manage to have a good time. I had fun making friends with hotties. Beauties that learned my stand on smoking and better uses for such fine lips. I don’t get it, how can you still in SF yet back in DC this same weekend to make Thanksgiving dinner?? What other cities are you posting to as well? OK, since I’m the one who mentioned tunnel top… can you tell me what made you think it was “too yuppie”? From the outside and the commentary, I expected Tunnel Top to be a dive bar. But once inside it was all glass and steel and populated by folks dressed for a night out. In fact, there was a group there in tuxedos who just came from some event. Now some nights that’s exactly what I’m looking for, but this night I was hoping to chill and and talk with Nicole. Catch up on things, which we really couldn’t with the noise and crowd. Not a dive- more of a fun after work place- but there’s a resident DJ who is quite good. I don’t know how old you are Wayan, but by your profession, I’m kind of surprised you feel like you’re not a yuppie. Regardless, it usually is a nice place to talk and not too noisy, and usually very friendly. I think you were there on an off night. Check the yelp reviews, they’re pretty spot on. This site isn’t really a review site. Maybe he wandered into Bar Cruda, instead… glass, steel, yuppies… sounds more like it. 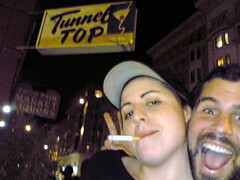 I can totally see Tunnel Top as a great place for a drink after work. It did have a good vibe. But late on a Friday it was full body contact just to get to the bar. Better that night was Bueaty Bar, out in Mission. Less flash, more funk. Beauty Bar was quiet enough you could talk? Now that’s an off night! If it’s Friday, and you want to talk to your friend, I’d suggest staying home! Even Hidden Vine is noisy. Yeah, seriously. Beauty Bar is a decidedly non-yuppie place but it’s not the sort of place I’d go if I were annoyed by Tunnel Top being packed and too loud.